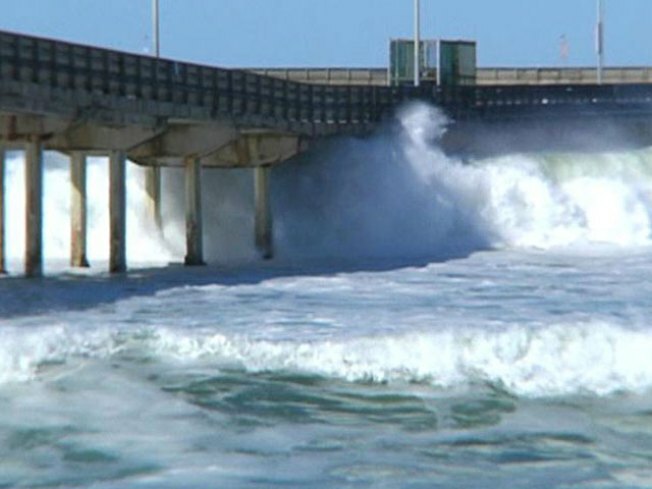 San Diego County is being hit with some strong Santa Winds, prompting a surf advisory in Ocean Beach as lifeguards have people wait out the rising waves on Sunday. The county's beaches are under a High Surf Advisory, according to The National Weather Service. "I would say the most important thing we want to let people know is that if you're not an experienced surfer, you'll probably wait and watch from the shore", said Lt. Greg Buchanan. Buchanan says the number of lifeguards has been bumped up due to the increase of people taking advantage of the overall great weather, in spite of the winds. Lara Viorato, of Chula Vista, was one of them. Viorato spent part of the day taking photos of the waves at Ocean Beach. When asked to describe it to those living elsewhere she replied, “There are no words to even describe it, this is just absolutely beautiful and these waves are just huge”. The National Weather Service also issued a High Wing Warning for San Diego County valleys and mountains, but those are expect to diminish after 4:00 p.m.
Sunday night the winds are expected to be calm with temperatures in the low fifties. During the week, the highs will hover in the seventies with the highest temperatures are expected on Wednesday with the highs in the high seventies. Winds speeds should fall to the single digits, peaking again on Wednesday at around 7mph.